The underwater plug has a body 7 in. long and a diameter of 1 3/8 in. at its thickest part. It tapers sharply toward the head and more gradually toward the tail. This plug has a metal lip of the size and shape shown below. If you use the through-wire construction method as described for surf fishing all you have to do is bend the lip and drill a hole for the wire loop which will form the eye as shown in the first 2 illustrations shown below. Another way to attach this lip is shown in the next 2 illustrations. You make and bend the metal lip the same way, but drill three holes as shown. 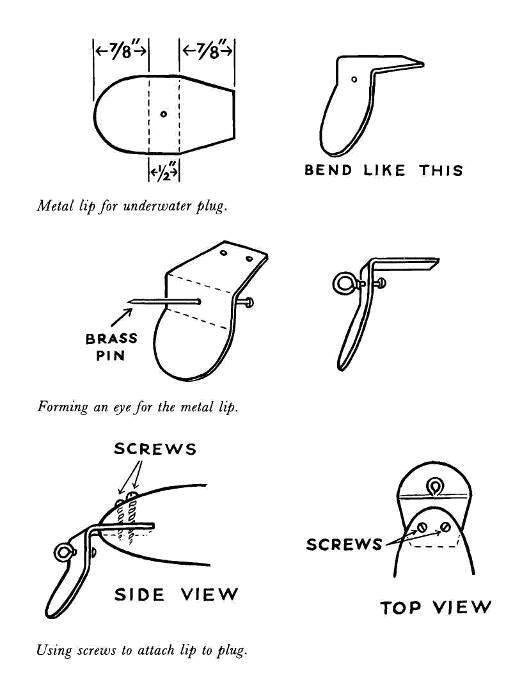 Then get a long brass wire nail, insert it into the single hole in the center of the lip, and bend with round-nosed pliers to form an eye for the fishing line. To attach this lip to the plug body, cut a slit to take the metal lip and drill two holes through the nose of the plug to meet the holes in the metal lip. Use two round-head brass screws to fasten the metal lip in place. See the last 2 illustrations. This plug also takes three 5/0 treble hooks, two at the belly and one at the tail.